New! This API now supports email discovery. When you follow someone on LinkedIn, a notification is sent to him/her. This is a chance for you to make them visit your profile or, even better, make them follow you back! Even if they don't, you'll have access to their publications and will be able to extract the list of people who commented and/or liked them. Our solution: Make people following you by following them. Starting from a Google spreadsheet filled with a list of LinkedIn profiles, Phantombuster will follow automatically all those profiles. Also, just a checkbox tick away and you can do just the opposite and unfollow each and everyone of them! Spreadsheet URL: The link of a Google Spreadsheet (or CSV) with LinkedIn profile URLs in it. Unfollow profiles: If you need to undo what you've done, select this option to unfollow the profiles from your list. If it's your first time, follow the full setup process. Your spreadsheet should contain a list of profile URLs (one link per row). You can also specify the name of the column that contains the profile links. Simply enter the column name in the next text field. This will launch the API and, if you didn't already change the spreadsheet URL, follow Phantombuster's team. Now that your API is ready, you just have to customize it to make it work repetitively. There you go, you only have to wait for the API to follow people for you! Thanks to our friends at Hunter (an email discovery service), this API can guess the email of each profile it visits. To use this feature, first create an account at Hunter here. Once done, get your Hunter API key by going to "Dashboard" > "API" > "Copy API key". 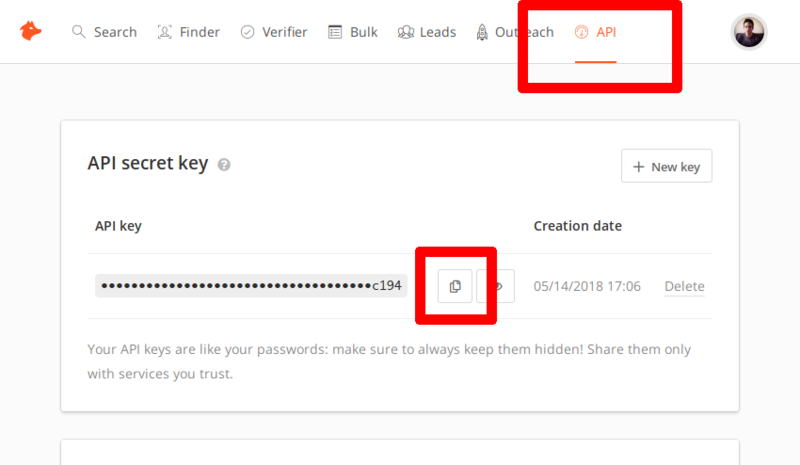 Paste your API key in the "Hunter.io API key" field in your API configuration. It will now guess the email of every visited profile! Expect a success rate between 20% and 50%. Hunter gives you 100 free email guesses per month. After that, you'll have to buy one of their plans or wait a month. Important note: When email discovery is enabled, the API will open LinkedIn company pages to get company domains. For this reason, we recommend you limit your visits to 40 profiles per day. Please be aware that this API, like most of our LinkedIn APIs, will manipulate your own account on your behalf. Like Uncle Ben once said, "With great power comes great responsibility." We have noticed that visiting more than 80 profiles per day will almost always result in LinkedIn invalidating your session cookie (that is, logging you out). 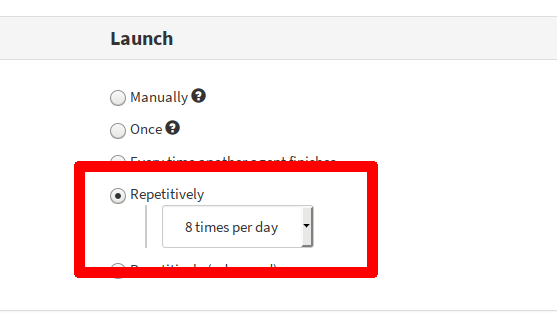 We recommend no more than 8 launches per day of 10 scraped profiles for this reason. Note: When email discovery is enabled, we recommend you divide this limit by 2 (that is, 40 profiles per day). Having a LinkedIn Premium subscription might raise this limit. Please see these official LinkedIn help pages: Commercial Use Limit and Finding People on LinkedIn.